Colorado will officially join the Pac-10 today. Nebraska will officially join the Big 10 today. There remains the possibility, as of this writing, that Texas A&M will part ways from Texas and join the SEC. Or that both will follow along with Texas’s originally favored plan to take both into the Pac-10. Or, even more remotely, that both will join the SEC. On some level, this is all thrilling. The landscape of college football as we have known it–virtually since its inception in some cases–is being seismically upheaved. The USC denouement grabbed a lot of headlines yesterday, but that story’s importance pales in comparison to the conference expansion rush. USC’s sanctions will seriously affect one team and one conference for, oh, about 10 years or so. Conference realignment will affect all teams, all conferences, from this point to all points forward. To watch it happen now, right before us, with its breathtaking Oklahoma land grab speed, is to inevitably have our college football fans’ pulses pounding. Our collective heart can’t help but race. But I wouldn’t say I’m excited. I am the opposite of excited, in fact. I am sad. More than that: I am mournful. Because this is college football. I can’t imagine a sport where tradition is–or maybe “has been”–more important, where it carries (“carried”?) more weight. It’s a sport played by amateurs, each of which don their team’s uniform for four years at the most. Our connection to our teams may start with the school we attended (or grew up near) and aided by the players who take the field, but it’s sustained by tradition: the uniforms, the cheers, the joy of shared history, the unique plural-s traditions, and perhaps most importantly, the rivalries. Everything else makes being a fan better. The burden of 75, 85, 100, 100-plus meetings between two teams carried on the pads of the players makes the game better. I may be wrong, but it’s my belief that during my lifetime–20 years ago, 15 maybe–those rivalries, the sum bulk of tradition, would have mattered more than money. Money has always mattered, of course. But in the final weighing, a lot of money added to tradition would have more value in college football than a little more money added to the abandonment of that tradition. On one hand: Heh. On another: have you really considered how deep the roots Nebraska is pulling up go? The Huskers joined the conference that would eventually become the old Big Eight in 1907, alongside three other schools. Two of those were the University of Missouri and the University of Kansas. Oklahoma University would join in 1920. The Huskers and Jayhawks have met on the football field every single year since, every season since 1906, the longest uninterrupted rivalry in college football. 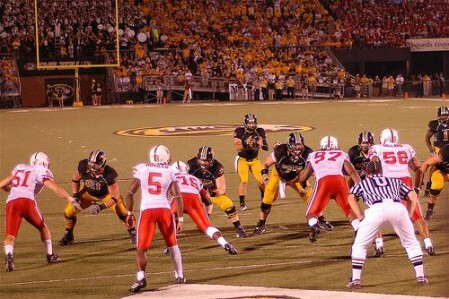 The Huskers have played Missouri 103 times , every year since 1922. It is the third-oldest college football rivalry west of the Mississippi. The Huskers and Sooners met every year from 1921 through 1997, have met a total of 85 times, and at one time were arguably the biggest, most important rivalry in the country. Beginning in 2012, Nebraska will play one of these three teams at most and possibly none of them. Their schedule will instead feature eight games against the current Big Ten, teams like Michigan St., Penn St., Indiana. Nebraska will travel to play Purdue, and it will be a conference game. The Huskers have exchanged hundreds of collective years of football history for a schedule that will bear no history at all. Rivalry, gone. Tradition, dust. To quote Fargo: all for just a little bit of money. So I am sad. As a college football fan, how can you not be? But as an Auburn fan, I am also thankful. It’s not my team, thank goodness, that’s made this decision. The worst-case scenario for Auburn is that Texas A&M and maybe another team will join, and that our team will play our old rivals Florida and Tennessee less often, or have our new rivalries with LSU (especially) and Arkansas disrupted. I don’t believe our series with Georgia or Alabama are in any danger of lapsing. But that’s today. Another 15 years, who knows? We lost Georgia Tech a long time ago. Then we lost most of our meetings with the Vols, and finally the series with the Gators became a once-in-a-while luxury. Nebraska and the other conference refugees have shown us today that there’s no rivalry, no tradition that can stand in the way of money. Why should Auburn’s be any exception? We will just have to be fortunate. We will just have to hope. Our roots are strong. They go deep, so deep. But college football is tugging at them anyway. from a dominance standpoint i can’t understand why Texas would even look at the SEC. the Pac 10 will be ripe for the plucking with USC in the crapper for the rest of this decade. and i for one would be relieved if we didn’t take them. oklahoma and texas a&m on the other hand would both intrigue me as i think they’d open up the state of texas ever wider to the SEC for recruiting. that being said, all those roadtrips to Austin that Auburn fans would miss out on are a bummer. that town rules so hard. college football people talk about tradition WAY too much. it’s all about pomp and circumstance, with all the old CFB fans. in other words, it’s all about hype. have you ever noticed how the most important college football analysis show is the Gameday PREGAME show, and the most important NFL show is the Primetime POSTGAME show. It’s because the NFL is all about results, while CFB is all about hype, tradition and the big powers. if there is a formidable opponent on the other sideline, it doesn’t matter how many times we’ve played them. it’s going to get my attention as long as they’re playing Auburn. when i read the title of this post, i thought you were going say tradition is mostly BS. unfortunately it went the other way, so i’ll just say it. Tradition is mostly BS. Just a thought…if the SEC adds 4 teams and that somehow shifts auburn to the east then we would play our 7 division opponents plus bama would become our west division rival. we would renew a rivalry with florida, keep our UGA game, renew with UT, and possibly renew rivalry with GA tech if they get added. I live in memphis so I hate the thought of road games to other east schools since starkville and oxford are so close. Buzzy, I could not disagree more. Tradition is BS? What if the ACC were to be proactive and try to steal Auburn and Florida from the SEC? This meant no more Iron Bowl, but it would mean an extra $4 million a year. There is no Auburn fan I know that would approve of this situation. Because it’s the rivalries, and the tradition that matters. If we stopped playing ‘Bama, then suddenly “Bo over the top” and “Punt, Bama, Punt” become a little less special. They have no context. It would also mean no more of the Deep South’s Oldest rivalry. These rivalries are what makes college footbal so much more special than the NFL. When we talk about football with our kids and grandkids is is the rivalry games we talk about. We won’t talk about when Auburn played Northwestern in the Outback Bowl, we’ll talk about when they played Alabama and Georgia. Those games count more because of the tradition. Today, Nebraska decided that that was not as important as extra money. For now, Aubun is safe, but once the door has been opened there is no going back. Enjoy it while it lasts, because it may not last for long. A thought just occurred to me. If the official had not put one more second on the clock in the Big 12 championship game, and Nebraska had won, would they still be leaving? Supposedly, Bo Pelini was heard yelling outside the locker room that they gave UT the second so they could go to Pasadena. Did that bad blood and the perceived lack of attention to the teams from the Big 12 North get under Nebraska’s skin? Did that play not only affect the 2010 national championship. but the entire college football landscape? Traditions do matter. If we play TAMU, there will be no stories I can tell my kids about past glories. Already it’s become that way..we have more tradition with Miami than with South Carolina. Our history adds spice and meaning to the whole gameday experience. Without it, it’s just meaningless ESPN Gameday hype. Auburn to the ACC sounds about right, since Tony Barbee is about to put into the hoops elite. free to pay the players and set the D1 football tourney. Pro ball is coming. Who will be the first CNFL commissioner? What will the salary cap be? Straws and camel’s back is what you described. NU was pissed about the money going to Texas, the loss of the OU game, even the fact that the Big 8 was abolished (the Big XII was a “new” conference — not an expanded Big 8 — insisted on by the Texas bloc, so all of NU’s conference records are no more) the cram down of Baylor and probably a lot of other stuff plus some sour grapes. Osborne’s statements from 94 and 96 indicate some one unhappy with the idea to begin with. Once he became A.D. this move was probably inevitable. Texas would bring a lot to a conference, but also demand a lot—in the case of the Big XII it was more than NU thought it worth. I am with Jerry or whoever wrote the piece—I wish the SEC would stand pat, but if we do expand, the I hope that Gene Stallings brings us A&M. Tradition rules the sport, and tradition threatens to blow up the sport. I very much agree about the value of tradition in CFB. I also consider much of this chaos to be brought about by college football’s hidebound approach toward its “championship[s]” and the creative ways the market has for dealing with the demand for more top-flight football. Fans overwhelmingly want a playoff. A playoff means the best teams in the sport battle it out across conferences culminating in finality. Because of the perceived self-interest of the bowls in thwarting this outcome, and because of the terror the NCAA has of driving off the football powers to do their own thing, this market demand has never been satisfied. So with all this pent-up demand, what’s a suboptimal way to redirect it? To bigger conferences. To a situation where Texas and Southern California or Nebraska and Ohio State meet up in more than the occasional bowl game or hyped OOC matchup. Those one-off situations make a little bit of money occasionally, but semi-regular meetings between those schools with a conference championship on the line makes a lot more. You’ve probably heard someone opine that we’re close to a de facto championship now that four superconferences are emerging. That remark is more significant than I first appreciated. I am afraid the SEC if getting passed by. They beat us at our own game. While the Big 10 bloviated about possible expansion to 16, those tricksy hobbitses in the Pac 10 quietly made their moves. I sincerely hope Slive is pulling out all the stops to get those OK and TX schools into the SEC. I understand it could mean cutting the same TV pie more ways for the duration of the ESPN deal (although I have heard reports that the contract may allow renegotiations if the SEC adds teams). But the SEC will certainly wish it had added those TV and recruiting markets when it comes time to either re-up with the WWL or to create its own network. I have heard the calls for the SEC to raid the southern half of the ACC (Clemson/GT/FSU/Miami). But those only make sense in the “regional rivalry” mindset that goes against the whole notion of conference expansion in 2010. None of those schools represent new cable markets or recruiting territories. They SEC wouldn’t gain a thing from adding them. The only name I have heard from the ACC that makes any sense would be VT, but the mid-Atlantic isn’t exactly CFB crazy like TX and OK are and it isn’t loaded up with recruits for us to raid like TX is. I am afraid Mike Slive is no Roy Kramer. And I know I am biased, how on EARTH can the WWL justify showing soccer while CFB armageddon is going on. ESPN should be preempting the world cup to show CFB live 24-7 unitl this is all resolved. I mean CFB is big boy business. If 4 teams are added from the West (Texas, A & M, Tech, and OU for example), then Auburn and Alabama would move east.